To all those who just lost their platform, I feel your pain. Seriously. Publications change, editors change, and one day you’re in, the next day you’re out, and maybe it’s your fault and maybe it isn’t, as in this case. It’s happened to me, just like it’s happened to you. When it happened to me I found myself “What in the world do I do now?” If you’re asking the same question I did, here are some ideas, based on my own experience, which I hope may be helpful. Forbes was the first outlet where I had an ongoing arrangement, and I leveraged my writing there to get into several other publications like Entrepreneur, Mashable, Fortune, and TechCrunch, and I knew I could get into others if I needed or wanted to. If HuffPost was your only outlet, it’s not too late to pitch yourself to other publications. The challenge you face is there are 100,000 other people who may be doing the exact same thing, at the same time. If you want a little extra help I have an online course that may interest you. Why not ditch the online magazine world all together and publish your work on Medium or LinkedIn? Actually, scratch LinkedIn–their blogging platform, formerly named Pulse, barely gets any traction these days. Medium, on the other hand, is still quite viable, and there are even fortunes to be made. Just check out how my friend Ben Hardy became the #1 writer on Medium and turned it into a $220,000 book deal. Got a blog? Write there. Don’t have a blog? Set one up. I recommend WordPress. And if you aren’t already building an email list, set up an account at ConvertKit today and start one. Maybe now is a good time to hunker down and focus on that book you’ve always wanted to write. By the time you’re done the dust of this HuffPost cataclysm will have settled and with a published book in your back pocket it will be easier than ever to get a contributor position somewhere else, if you still want one. If you need a little confidence to boost you over the line, read Jeff Goins’ book Real Artists Don’t Starve. There are plenty of people out there who need ghostwriters. There are lots of companies who need great copywriters. 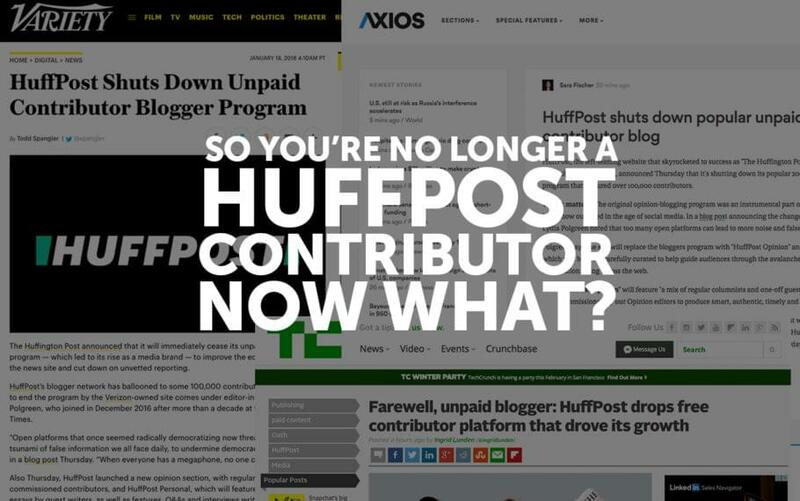 Can you leverage your portfolio at HuffPost to get some contract or full-time work? I wrote 164 articles for Forbes during a three year period, but ultimately parted ways when a new editor came on board and we didn’t see eye to eye. At the time it was a bummer to no longer be on the platform, but then I thought “You know what? I had a good run, maybe it’s try to try new things.” I already have a business, a marketing agency called MWI, but I’ve got a management team in place that does a much better job running it than I ever did, so I started coaching others on influence and thought leadership, and in many cases I taught people how to get on at top pubs as contributors. I started a Facebook group called Influencer Inc, which then led to some splinter groups (like one just for contributors like you), and that group has supported what has now turned into a training, coaching, and events company. If I hadn’t left Forbes, I’m not sure it would have happened. Perhaps this step will be a blessing for you, as well.